Last year I read Robert Capa’s wartime memoir Slightly Out of Focus for the first time. It certainly won’t be the last time I read this book. What immediately impressed me is Capa’s ability to turn a phrase. He generally presents himself in a sardonic pose, but also writes beautifully and with great compassion, for example when describing his mother’s ambivalence towards him going to war again. She was a very torn mother that morning, hoping for my sake I would succeed in getting the various permits and get away; for her own motherheart, praying that something would go wrong and that I would not be able to go off to war again. That single word motherheart sums up so much of the relationship between a parent and child. Once a year, usually in April, every self-respecting Jewish family celebrates Passover, the Jewish Thanksgiving. When dinner is irrevocably over, father loosens his belt and lights a five-cent cigar. At this crucial moment the youngest of his sons — I have been doing it for years — addresses his father in column Hebrew. He asks, “What makes this day different from all other days?” Then father, with great relish and gusto, tells the story of how, many thousands of years ago in Egypt, the angel of destruction passed over the firstborn sons of the Chosen People, and how, afterwards, General Moses led them across the Red Sea without getting their feet wet. 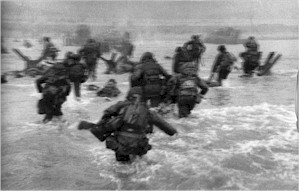 When he does describe his part in the D-Day landings, the full horror of that battle is made clear, and Capa does not spare himself in describing how he had an option to leave the beach and took it, unlike the other soldiers dying around him. When I started to read this book I expected it would be about photography, but Robert Capa was also a fine writer and produced a touching and funny description of the events he took part in. I just couldn’t put this book down once I started reading it.